I'm not sure why I liked this book. Maybe it was the half naked man on the cover. Maybe it was the religious foreshadowing, the looming Gothic art and the mysterious passageways into long lost secrets, that moved my brain to crave it like a big bowl of the banana cream cake I just had after dinner. I became slightly involved with this book. It haunted me a little. It haunts me still, and that surprises me, because there is very little romance, very few people die (but when they do die, they die spectacularly), the praise on the back cover catalogs words like: alluring, delicious, gorgeous, beguiling and holy, and I usually try to avoid books with so high of appearance adjective praise...they frighten me into disliking them. So what was it then? The atmosphere. I became quite lost in this world she's created. A world that's deeply religious, mythological, and historical at the same time. 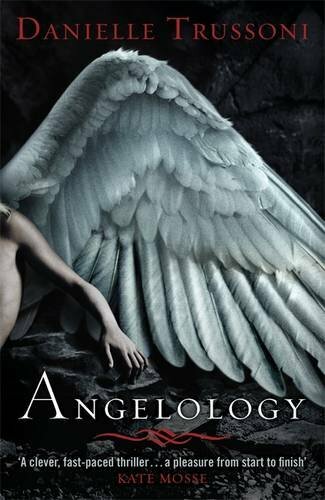 A world where angels and humans are at war with each other. A world where if you really want to know what happens read Misfit Salon's excellent review of this book here. The plot is complicated and diverse, very descriptive and bordering on verbose, but still, I liked it. But who knows, maybe it really was the naked man on the cover. You know, my favorite part of this book was the cover. Well done, whoever designed that cover. From your review, the cover and even down to the author's name, I sense the magnetic pull this book has which definitely feels like a guilty pleasure to me. Intriguing! Yes, it's hard not to be curious about what's on the back cover of this book.. wouldn't you like to know.. If you like gothic mysteries, this one isn't bad. Not my favorite, but not bad either.